Alfredo Petroni is a 40 years old marathon runner, living in Italy. He had a dearm : Sharing his passion endurance running and for his hometown by organizing a marathon in Lucca. This year, his dream will come true. Alfredo kindly answered my usual questions to present his race. Hello, on October 25th 2009, you’ll be organizing the Lucca Marathon. Can you tell us where it is located? Lucca is located in Tuscany. Pisa is only 30 km away and Florence 70. Because we would like to give an opportunity to the marathoners to run a marathon in a very very beautiful town and area. The Marathon will start from the historical center of the town (on the top of the walls). After about 4 Km on top of the walls , there will be 2 Km inside the town. Then the course will get out from the historical center to head to some of the most beautiful villages located around Lucca. The runners will be back to Lucca after around 40 Km ,enter again into the historical center and will pass through the most beautiful ‘il Anfiteatro Place’ , the finish line will be located in the gorgeous Piazza S.Michele. You can find the map of the route on our web site. We focus ourselves on the marathon, but we will also organize a 5 km noncompetitive race that will be open to everybody and it will be in the historical center of the city. In October normally the weather in Lucca is perfect to run a Marathon (not too warm and not too cold) , the temperature is around 15° C (59 °F). Beside the Marathon we have organized an EXPO area (starting two days before the race) where the runners will be able to pick up their race package as well as some touristic information. The marathon finished, what advice would you give a runner who has never been to Lucca before? A good restaurant, a fancy sightseeing? In a single sentence, what would you tell the readers of 42k195 to make them register for the Lucca Marathon? 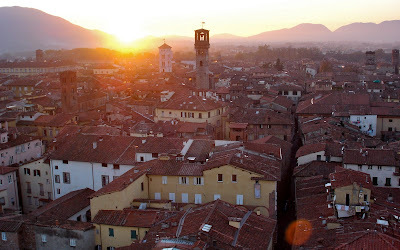 Come in Lucca because you have really the opportunity to run a marathon in a very very beautiful and charming town !! !